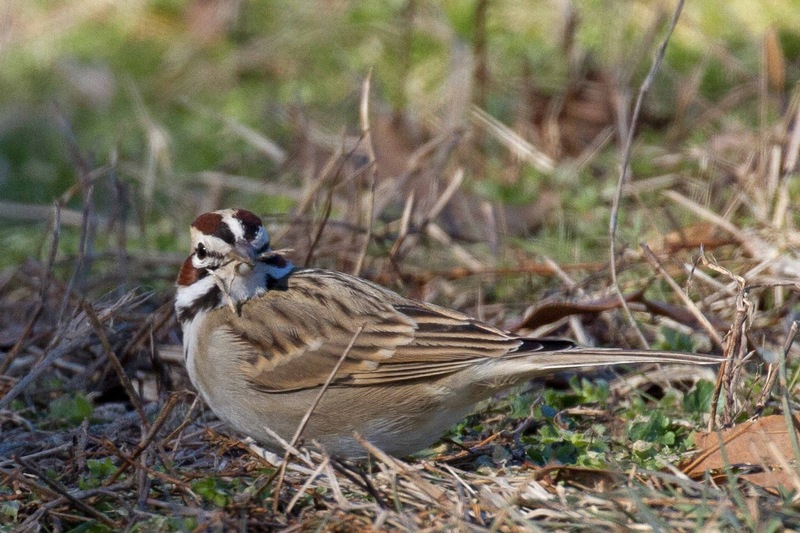 Philly Bird Nerd : Speaking of Sparrows . . . I finally got to spend a whole day in Cape May birding last weekend. Harvey and I started in the Villas searching for the Varied Thrush that eluded me on my last trip. We spent a good amount of time walking the old fairways and finally got a fleeting glimpse of the bird as it flew past us at break neck speed. No photos and a really crappy way to get a life bird, but it is checked off the list. I hope to see more on my next trip out west which is where this bird belongs. Once the Varied Thrush was found, Harvey and I headed out to see some other cool birds that were being seen at Beach Plum Farm in Cape May. This is a working farm where they have free range chickens and grow produce for the local restaurants. It is only open to the public on weekends which was fine since we were there on Saturday. 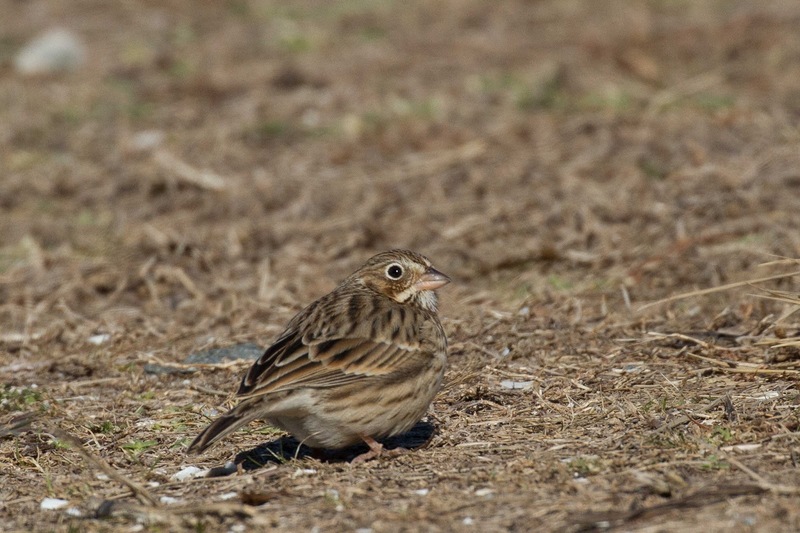 Two sparrows were reported there - Lark and Vesper. 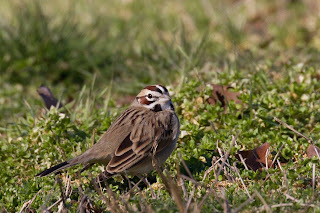 Both are uncommon species that show up sporadically in our area. Vesper sparrow isn't a particularly pretty bird. It is pretty drab gray/brown but has one distinctive field mark that you can see clearly - the white eye ring. This bird was very accommodating. When we arrived, the bird was flitting in and out of some hedges but decided to fly out into the driveway to pick at seeds on the ground. There were other birders and photographers there but I crept up the driveway on my knees to get these shots. The bird didn't care at all. Here is the bird happily chomping on a seed. What the Vesper sparrow lacks in wow, the Lark sparrow has in spades. 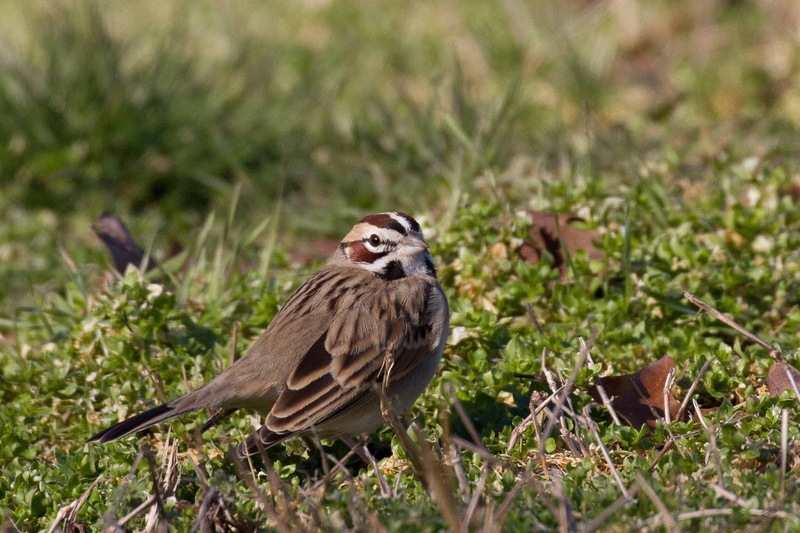 This is an easy bird to ID in the field with unmistakable face pattern. Once again, creeping on my knees allowed me to get these shots. Here is the bird happily eating some grass seed. Back in the parking lot, we couldn't resist spending 25 cents to feed the chickens. Boy are they aggressive. Here is Harvey getting his hand bit off. I will have to remember to bring the kids that visit us during the summer here. Just down the road from the farm is the site of an old Magnesite Plant that was used during WWII. The plant is gone except for a water tower. The ground is so polluted from the spoils of the work that hardly anything grows there. 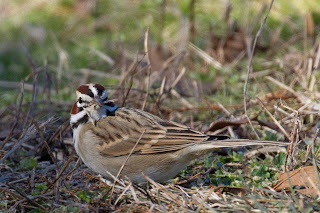 The habitat is ripe for sparrows. Someone has bird feeders in the parking lot so Harvey and I took the short ride to see what we could see. 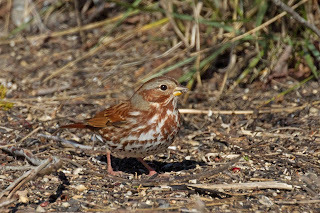 Best bird was this Fox Sparrow. 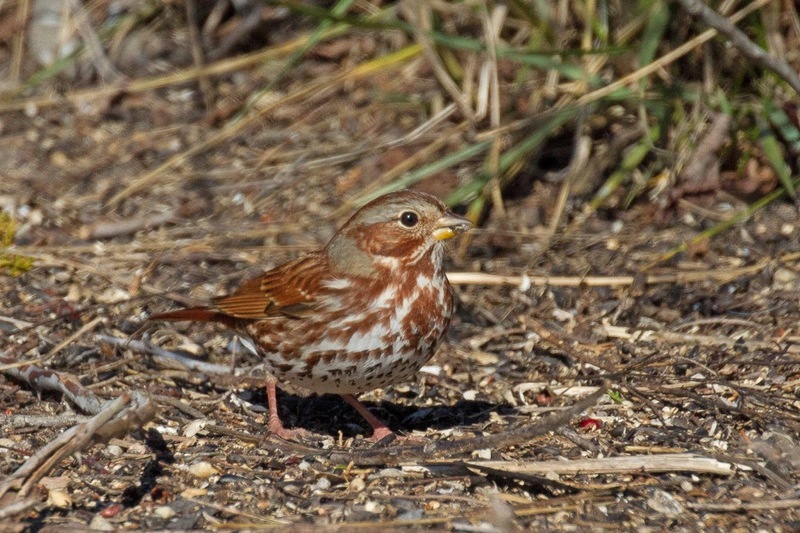 You can see why they are called Fox sparrow due to the color. Again, this one posed with seed for me. Why not round out the day by birding the beaches along the ocean. We stopped at Two Mile Beach just south of Wildwood to see some of the damage caused by the recent winter storm which dumped all of that snow up home. Hundreds of Welks washed up on shore. Here is a shot that I staged to show the Welk shells with the damaged sand dunes in the background. 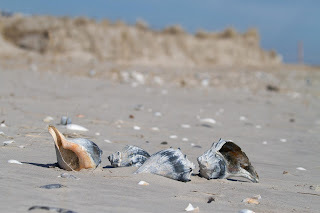 Harvey and I each left with a shopping bag full of shells. We headed to Stone Harbor Point to see more birds. 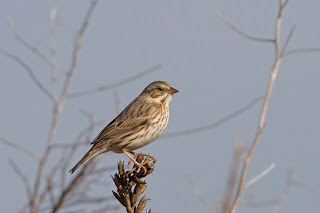 We caught a brief glimpse of a Pipit and actually heard it call "PIPIT". 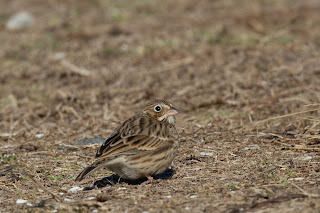 This Ipswich Sparrow posed briefly before disappearing behind the dune grass. This is another subtle beauty. 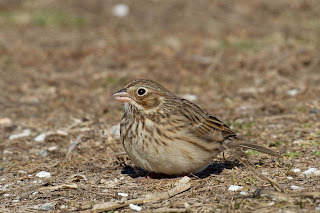 Ipswich is a race of Savannah sparrow that are only found near the beach in winter. All in all, it was a great day for mid winter birding. Especially since the weather has been too warm to send the ducks, geese and seabirds south.